This event raised $2500 (50 boxes sold at $50 each) from the jewelry pull. All jewelry was donated by Kendra Scott. 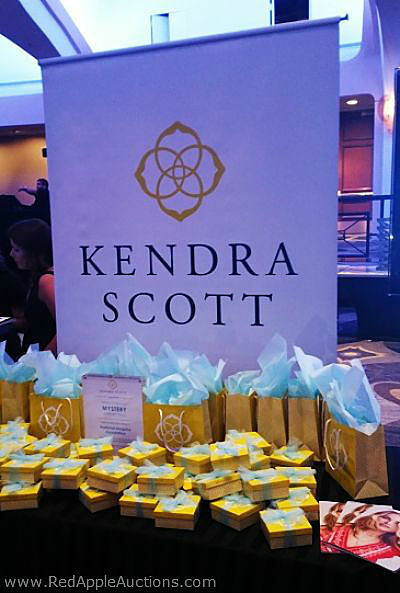 If a Kendra Scott jewelry store is in your area, call the community / charity relations contact in your local store. For the last two years, my clients have received generous donations from the retailer via its “Kendra Gives Back” program. Frankly, I haven’t seen this kind of generosity since Keurig hit the market several years ago. Do you remember that? Not so long ago, every auction I worked had at least one Keurig coffee system in its silent auction. It was often accompanied by a huge basket of single serving coffees, which was also donated by Keurig. I think Kendra Scott is just as generous. The company offers an easy jewelry donation that looks great on the table and is popular with guests. This post shows photos from three fundraising auctions (two in the Washington, D.C. metro area and one in Georgia) with donations from Kendra Scott. This nonprofit opted for their gala to have a silent auction donation instead of a jewelry pull. 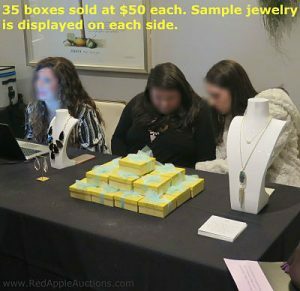 My clients are typically asked if they’d prefer selling a single item in the silent auction or a number of different items via a ‘jewelry pull’ activity. If you opt for the jewelry pull, the store will donate up to 50 pieces, each attractively presented in a yellow box. Tip: Consider the best number of boxes for your group, based on crowd size and competing activities. Most of my clients take between 30 and 50 boxes. Each jewelry piece is valued from $50 to $195 and is sold for $50. If you opt for the jewelry pull, the store sends staff to work the table. This means you don’t need to assign volunteers to this job — I love this! These Kendra Scott staffers started selling once guests arrived. Also, if you opt for the jewelry pull, Kendra Scott sends along a few additional pieces to be used as a display, so guests can get a sense of the type of jewelry in the boxes. Has Kendra Scott recently opened a store in your area? If so, don’t delay in reaching out. It’s not unusual for companies to hit a saturation point and become more selective in their donations. Whether sold in the silent auction or as a jewelry pull, my clients have found this jewelry to be popular. Have you used donations from Kendra Scott? if so, what was your experience? Thank you so much for sharing! This is a great opportunity that I wasn’t aware of, however I’m not surprised at her generosity. I first learned of Kendra Scott recently though an NPR podcast called “How I Built This.” Guy, the host, in one episode interviews Kendra to explore how she turned a jewelry business in her spare bedroom into a near billion dollar company. It’s a great story. I didn’t know she was on NPR. I’ll have a listen — thanks for sharing. Thank you, thank you, thank you for pointing us in Kendra Scott’s direction. Within a few days of emailing our local store we were connected with a Kendra Scott representative. She was genuinely interested in our mission and wanted to learn more about our work. After a conversation about our organization and our event she offered to donate a basket of three pieces at a total value of $350! We are so excited! Kendra Scott’s team really makes philanthropy a focal point and we’re thrilled to introduce such a great company to our guests. That’s exciting to hear, Alice! I know your guests will love it. I was so excited to find a Kendra Scott store nearby and sent a request. They got back to me within two weeks that they will be sending some pieces for our auction! Thank you for the great tip! Woohoo, Teresa! I expect it to sell well. If you’ve seen her jewelry, it’s on trend. We would love to have a silent auction item or two of Kendra Scott Jewelry for our only fundraiser that is coming up June 26, 2019. We don’t have a website, we only have a Facebook page as we live in a very small community.